Peoples Southern Merges with River B&T - Porter White Co.
River Financial Corporation of Prattville, AL and PSB Bancshares, Inc. of Clanton, AL have closed their merger, effective October 31, 2018. The combined bank has approximately $1.1 billion in total assets, $700 million in total loans and $900 million in total deposits and has fourteen locations across Alabama. 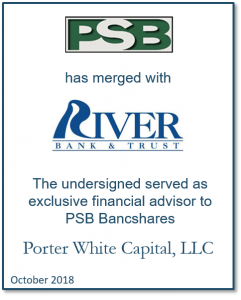 Porter White Capital, LLC served as exclusive financial advisor to PSB Bancshares, Inc. and Peoples Southern Bank.